Lately, it seems that everyone I know is going through some sort of stress, me included! I have tried yoga, reiki energy healing, exercise, meditation and hiking, but I’m still stressed. Funny, but this morning I ran across an article that a friend of mine wrote for Forbes Magazine. It’s all about stress and food. The theory of food and stress makes so much sense to me. Since you know I can’t resist sharing, here’s to happy reading and cheers to eating, STRESS FREE! If you’re like most of us, coffee is more than just a beverage, it’s a way of life. There is pretty much no problem that can’t be solved with coffee…until now. Grabbing a cup of coffee multiple times a day may help you go through the motions more easily, but consuming nutrient dense foods can not only help you stay awake and alert, but can also help to boost your mood. In fact, in my most recent book, Strong is the New Skinny, I recognize the direct connection between your diet and emotions. I even include a list of foods that are often overlooked when it comes to their effect on mental health and stability. Like everything in life, moderation is key. Instead of completely breaking off your relationship with coffee, try making it your acquaintance – instead of letting coffee be the friend that picks you up just to push you back down, try drinking just one cup of coffee a day and incorporating these 15 foods into your diet. These foods will not only keep you more satisfied throughout they day, but will also boost your mood, help to eliminate stress, nourish your body and fill you with the energy you need to get through the rest of the week. Instead of counting down the hours each day, you’ll soon feel fulfilled, energized, and ready to take on whatever is thrown at you throughout the week. Our society has created a silent ban on egg yolks because of studies that have scared us into thinking that our cholesterol levels will spike upon consumption, but let’s dig a little deeper here. Egg yolk does, in fact, contain cholesterol and once again, moderation is key here, but studies have recently been recognizing egg yolk as dietary cholesterol. 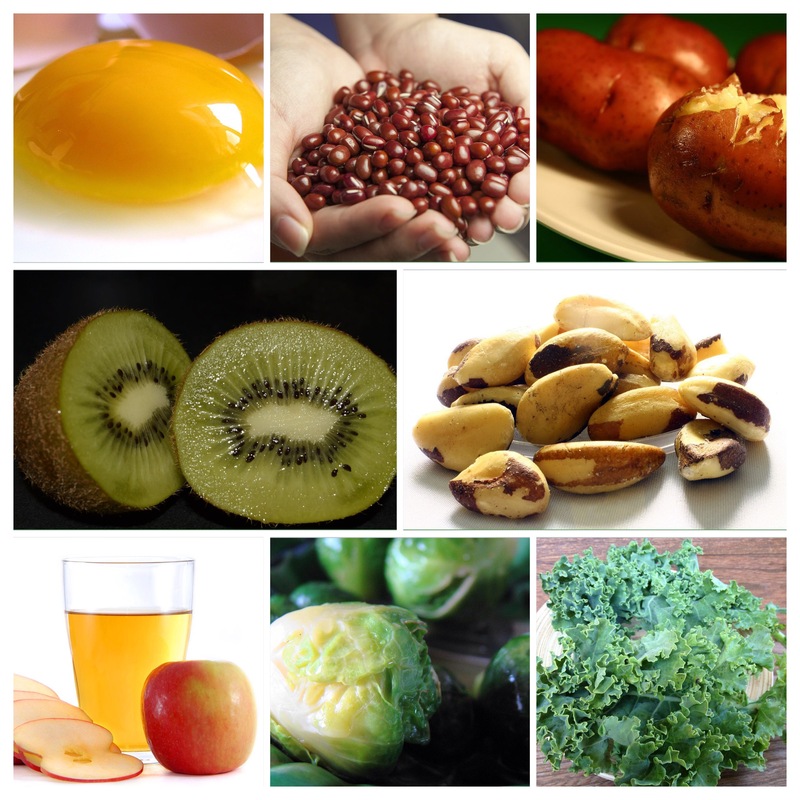 This works to raise the “good” HDL cholesterol, while sugar and grains are the foods that are to blame for raising the “bad” LDL cholesterol and the triglycerides in the blood. Egg yolk is also a leading source for choline, a nutrient that has been found to boost brainpower by speeding up the sending of signals to nerve cells in the brain. Incorporating one to two egg yolks into your diet each day may make you feel more bright-eyed, even on your darkest days. Potatoes are often thought of as comfort food that you mash up and saturate with butter, salt, and sour cream. While this may sound tempting in the moment, there is a reason for the phrase “couch potato.” The sluggish, run down feeling that you get after indulging may be enough to convince you to steer clear of this temptation in the future. Instead, try blue, purple, and red skin potatoes for quite the opposite effect. Due to their colorful outside appearances, these potatoes contain 30% of your recommended vitamin C intake, iodine, and also contain a special antioxidant that helps to prevent brain aging and promote lower blood pressure. Recently, antioxidant superfoods like blueberries, acai, and kale seem to be constantly trending in the world of health and wellness. However, there is one antioxidant-filled superfood that has yet to be recognized for all that it is: red beans. Red beans are densely packed with essential nutrients and have recently been acknowledged as one of the richest foods in antioxidants. Frequent consumption of these beans will help to prevent cardiovascular disease, iron deficiency, and Alzheimer’s disease and will also work to stimulate your attention and memory. I think that if we put the word “Brazil” next to just about anything, it would sound infinitely better. In this case, it actually is better. This is because Brazil nuts contain exceptionally high levels of selenium, which is a mineral that plays a key role in your metabolism. Research has also shown that selenium can reduce feelings of depression and help to boost your overall mood. Adequately incorporating selenium into your diet will not only put you in a better mood, it will also help to prevent coronary artery disease, liver cirrhosis, and cancer. Just 1-2 nuts a day provides enough of this trace element. The seeds found in the center of a kiwi do more than just get stuck in your teeth. These little black seeds contain a surprising amount of essential nutrients. They may be tiny, but kiwi seeds contain fiber and a mood-boosting nutrient called alpha-linolenic acid. ALA is a plant-based omega-3 fatty acid that helps to contain an inflammatory compound linked to depression. Kiwi is commonly found in a standard fruit salad, yet most people fail to leave a place for it in their kitchen’s fruit bowl. Incorporating this fruit and its seeds to your daily diet will leave you beaming with satisfaction, just don’t forget the floss for afterwards! “A glass of apple cider vinegar and water a day keeps the doctor away.” Not quite as catchy as the original saying but definitely more accurate. This is because apple cider vinegar provides a wide array of health benefits, including the fact that it can help prevent weight gain, anxiety, depression, and distress. Besides helping you feel more full after eating less food, drinking one or two tablespoons of apple cider vinegar before each meal can help break down proteins into amino acids, which will ultimately create tryptophan. Tryptophan plays a critical role in the release of serotonin, which is one of our “feel-good” neurotransmitters. The more we assist in the creation of serotonin, the happier we’ll be. While saffron may be beneficial to everyone, this one mostly applies to the ladies out there. Studies have found that this spice has the ability to “decrease PMS symptoms, such as mood swings and depression, by at least half.” Researchers believe that saffron helps make the feel good neurotransmitter, serotonin, more available to the brain, which will greatly affect your overall mood. Just by reading the word “microalgae” I probably lost most of you – but hear me out. Certain types of algae provide magical benefits and are a legitimate source of a number of vitamins and minerals. Edible algae, otherwise known as blue-green algae, include several types of bacteria and microalgae. This ocean-based superfood is highly probiotic, which helps aid digestion. This is more important than it may sound. Digestive issues are a leading cause of fatigue. If your body is not properly breaking down the foods you’re eating, then you won’t gain the benefits from them. Not obtaining the nutrients that fuel your body may cause your body to lack vital elements that aid in the production of serotonin and dopamine, which can ultimately cause serious long-term effects and possibly even mood disorders. When it comes to the vegetables that you incorporate into your daily diet, eggplant is often excluded. However, you may want to rethink that. Alternating between eggplant and meat for dinner during your week may bring you less anxiety, less depression, and less hostile feelings. Research has recognized an antioxidant called chlorogenic acid, which has the ability to fight free radicals and lower LDL, to be the dominant antioxidant compound found in eggplant. Eggplant is also rich in minerals, boasting a large quantity of potassium, magnesium, calcium and phosphorous. With no fat, six grams of carbohydrates and 27 calories in a 1-cup serving, eggplant makes an excellent addition to any diet. I know, I know, you want to kale yourself with the amount of times you’ve heard about the many benefits of kale, but it’s hyped for a reason. Kale is loaded with folate, which prevents mental fatigue and forgetfulness by increasing blood flow to the brain. Kale is also an excellent source of Vitamin E, which shields your brain from nerve-cell degeneration. Don’t let all the talk about this superfood kale your vibe. Instead, try it out and see what all the talks about – you can thank me later for that mood boost. Alzheimer’s researchers have recently found that the polyphenols in Concord grape juice might help stimulate our minds. Polyphenols are micronutrients in our diet that help refine communication between brain cells. Studies have shown that drinking this juice may help improve people’s spatial memory and verbal learning skills. Besides enjoying a bit of mental stimulation, this juice also plays a role in supporting heart health. Try filling a glass with half Concord grape juice and half water in order to dilute the sugar levels -Your body will be smiling on the inside. There’s a reason everyone’s in love with the coco. Adding coconut oil to your diet could work wonders for you, your hair, your skin, and your body, but besides the many beauty benefits, coconut oil has the potential to make your longest days feel a little bit shorter. Coconut oil contains medium-chain triglycerides (MCT) that may increase your energy levels by 5%. Researchers have also found that the body uses coconut oil’s rich MCT fats to increase energy, aid in detoxification of the liver, improve metabolism and fuel the brain’s production of serotonin. Tahini is a paste made from ground sesame seeds that is often used in both sweet and savory dishes. While many people have heard of tahini, what most don’t know is that there are two different types of tahini- hulled and unhulled. When it comes to obtaining the most vitamins and minerals, unhulled tahini is the way to go, as it’s made from the whole sesame seed, as opposed to being stripped down like the hulled tahini. Tahini paste is rich in magnesium and B vitamins, which are important players when it comes to converting carbohydrates into energy. Swap your afternoon coffee pick-me-up with this tasty paste and enjoy feeling energized and satisfied, minus the jitters. This vegetable that we used to categorize as scary green monster balls when we were kids deserves some recognition for their change in reputation. Brussels sprouts have omega-3 fatty acids, which are a type of polyunsaturated fat that may have the ability to boost brain health, lower blood pressure, prevent heart disease, and help treat depression. When most people hear Omega-3, they immediately incorporate it with fish, but it is actually found in many other plants, nuts, and seeds. If Brussels sprouts still don’t sound palatable, have no fear. Cauliflower, walnuts, canola oil, flaxseeds, flaxseed oil, hempseed oil, camelina oil, and chia seed oil are also packed with omega 3s. Now that we’re more aware of how certain foods can help us, we can be one step ahead of the game. Incorporating these 15 foods into your diet will change the work-week for good!